Edina put together a nearly flawless effort to earn its third consecutive Class 2A swimming and diving title on Friday at the Jean K. Freeman Aquatic Center on the University of Minnesota campus. The Hornets won six events, getting two victories from Claudia Chang, a victory from Lily Gremmels, a third consecutive diving title from Megan Phillip and two relay victories en route to 365 points. Edina’s Lake Conference rivals Minnetonka (231), Wayzata (186) and Eden Prairie (178.5) finished second through fourth. Chang, a sophomore, won the 200 and 500 freestyles and swam a leg on the Hornets’ winning 200 and 400 freestyle relays. Gremmels, a sophomore, won the 50 freestyle. Phillip, a junior, won her third consecutive Class 2A diving title with an all-time state meet record of 517.00 points. Her mark broke the longest-standing state swim meet record of 507.00 by Wayzata’s Jamie Sanger in 1997. Phillip won her first title with a score of 480.85. She had a 476.05 last year. Edina and Wayzata have combined to win the past nine Class 2A state titles. St. Michael-Albertville senior Emma Lezer won her third consecutive 100 breaststroke title. Lezer also finished third in the 100 butterfly. Minneapolis Southwest junior Peyton D’Emanuele won the 100 butterfly, edging defending state champion Molly Meland of Hopkins. For the second consecutive year, Visitation used its depth to outlast Hutchinson for the girls’ Class 1A title. And for the second consecutive year, the Blazers didn’t have an individual champion or win a relay as they earned their sixth consecutive (10th overall) state title. The Blazers finished with 319.5 points. Hutchinson, which had two individual champions and won two relays, was second with 272 points. Visitation got runner-up finishes by its 200 medley and 400 freestyle relays and from Kali Fischer (200 individual medley) and Maria Mattaini (500 freestyle). The Blazers scored points in all 12 events. “We got great swims today,” Visitation coach Nate Linscheid said. “I think that’s a testament to the quality of swimming in Class A.
Benilde-St. Margaret’s sophomore Taylor Williams, Breck freshman Yvonne Jia and Hutchinson freshmen Grace Hanson and Hailey Farrell won state titles. 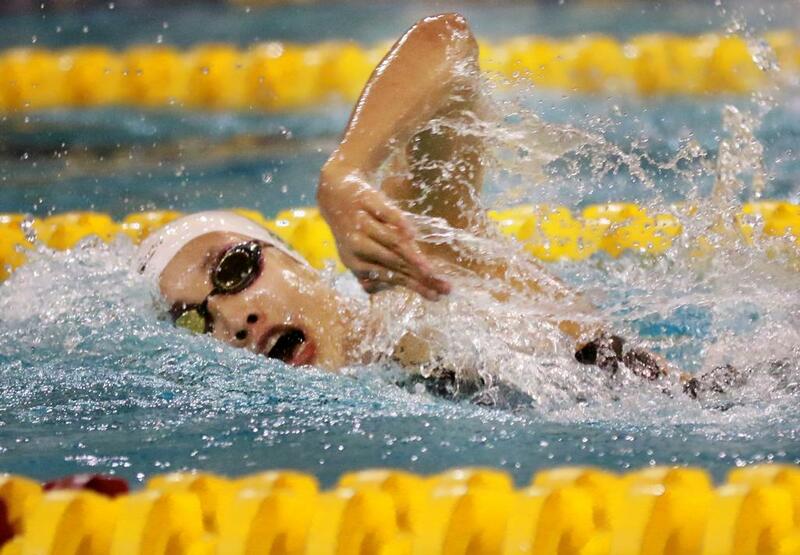 Jia, in her first state meet, won the 200 individual medley and the 100 butterfly. She also swam a leg on Breck’s winning 200 medley relay to help the Mustangs to a strong third-place showing with 234 points. Farrell, the 500 freestyle runner-up as a seventh- and eighth-grader, won the 500 freestyle, finished second in the 200 freestyle and swam a leg on the Tigers’ 200 medley and 400 freestyle relays.